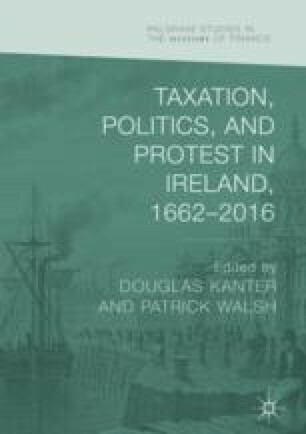 This chapter explains how financial relations between Britain and Ireland were arranged by the Act of Union (1800) and presents some of the consequent financial and political difficulties. The arrangements were intended to be generous to Ireland. Nevertheless, Ireland struggled to meet its financial obligations. As Irish debt increased and options for raising income from taxation shrank, it became important to minimise collection costs. But this meant addressing the issue of patronage and challenging the existing culture of political management in Ireland and even the viceregal system of government of the Lord Lieutenant and his Chief Secretary. The Chancellors of the Irish Exchequer were frustrated in their attempts to manage Irish public finance.